Over sixty years ago veterans put aside their political, racial and ideological differences to unite for a common cause. 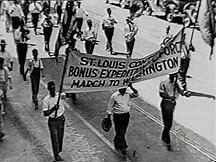 That cause was named "The Bonus March". Part of their mission was to place military veterans in seats of Congress to ensure those who served our Nation in uniform would never be forgotten... never be slighted. The Bonus Marchers achieved their goal. For over forty years after the Bonus March both the House and Senate were led by veterans who looked after their own. The sad fact is, Vets have dropped the ball. We have lost our numbers and our strong voices in Congress. We need to get them back. Putting aside any differences we may have, We need to come together as veterans. Only by making life for older veterans secure can we secure for our military services future generations of young and proud men and women who will want to serve. We need to work together to ensure at least one veteran is among the candidates of every office up for election. 1. Join with other vets in your community to form a non-partisan League of Veteran Voters chapter. 4. Develop a list of veteran needs your candidate will fight for when elected. 5. Link your Chapter with League of Veteran Voter chapters in nearby communities. 6. Hold regular town hall meetings with veterans and veteran candidates to discuss veteran needs and legislation. There's no excuse for us to be treated like we're in the minority. If we can win wars we can win elections. Concept of The League of Veteran Voters originated by Col Jerry Bowen, Jul 1991. Page and text authored by Phill Coleman, Jun 1999.